Every so often — once a month or so — Ritsuko goes to Osaka while I stay here in Okinawa to work. It works really well; she visits our relatives and meets her friends in Osaka, while I can geek our with computer games and hobby projects(1) here in Naha. And I can cook any food I like for myself. 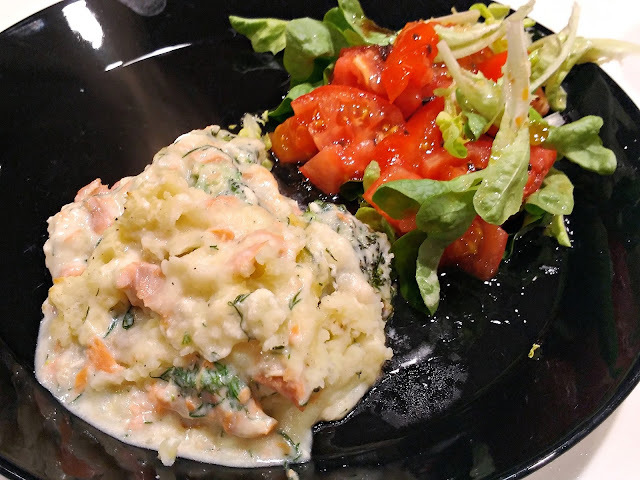 Ritsuko is in Osaka this week; I had a can of cooked salmon at home, and I just realized that I haven't had a real fish gratin in years and years. It's easy to make and it's a very forgiving dish, so you can easily substitute ingredients. It took only an hour from stepping through the door to sitting down for dinner, and I managed to take a shower and hang the laundry as well. 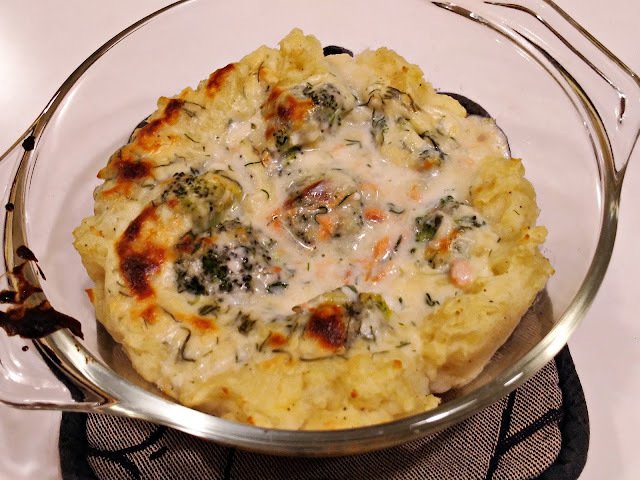 I took some cooked salmon (you could just fry or steam a bit of raw salmon filet), about half a broccoli, two potatoes, and some milk, shredded cheese and fresh dill for the sauce. Peel and boil the potatoes for potato mash. Meanwhile briefly boil or steam the broccoli bouquets, just enough that they soften a bit. Make a bechamel sauce on about 150cc milk. Add the fresh cut dill, take off the heat and mix in the grated cheese. 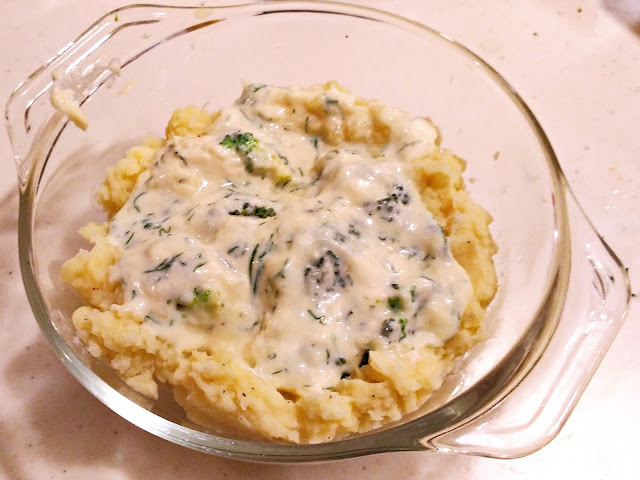 Make the potato mash with the remaining milk, butter and salt, pepper and nutmeg to taste. Make it a little toward the soft or runny side. In a oven-proof container, spread the mashed potatoes on the sides. Assemble the bits, with the mashed potatoes around the rim. 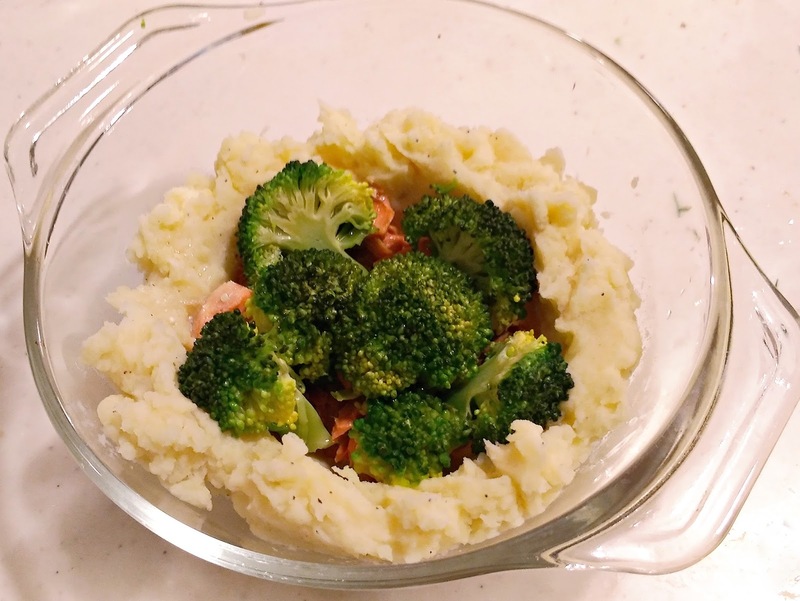 Add the salmon, in bite-sized pieces, then the broccoli in the center. Mix in the sauce. Make sure no fish sticks out (it burns easily) and that the vegetables are covered with the sauce. The mash looks better without. Pour over the sauce, and gently mix the sauce, the broccoli and the salmon so it's all covered. Finished! I would perhaps give it a little bit more colour next time. Bake in a hot oven (220°-240° or so) for about 20-25 minutes until it takes colour. It's all cooked already so it just needs mixing and heating up. Dinnertime. A simple salad goes well with the heavy gratin. It was tasty! I can't believe I've waited this long to make it again. The trick here is really that the fresh dill mixes with the flavour from the fish as it bakes. You can use any firm fish, really, but cod and salmon are common.